The Division update 1.17 released on PS4, Xbox One, and PC. According to the official the Division 1.17 patch notes, all players will have access to new PVE mode—Resistance and new PVP mode—Skirmish. In addition, the West Side Pier map expansion will also be available for free. Alongside the launch of the Division version 1.17 update, all three DLC’s for The Division will be available for all players for a limited time. Players without the Season Pass will have the opportunity to play Expansion I: Underground, Expansion II: Survival, and Expansion III: Last Stand until December 10. The Rogue system in the Dark Zone has been overhauled for The Division update 1.17. The Division 1.17 introduces a new PvE game mode called ‘Resistance’ where factions are teaming up for the first time to fight against Division agents. Enemy NPCs continuously spawn in waves as the agents try to survive for as long as they can. Added resistance Commendations with The Division version 1.17. The Division update 1.17 added ability to fast travel to Daily Operations. The Division1.17 adjusted PvP modifier to balance TTK with the new stamina improvements. The Division version 1.17 replaced all instances of the + Weapon Damage gear statistic with % Weapon Damage. This results in more consistent benefits for all weapons regardless of RPM. Deconstructing High-End gear, High-End weapons, Gear Set items, Classified Gear Sets, Exotic armor and weapons now has a chance to reward D-Tech. The Division update 1.17 fixed a bug where agents could fire faster than intended with any Bolt Action rifle. The Division 1.17 added rarity colors to the inventory’s Appearance menu so that it matches the behavior in the rest of the UI. The Division version 1.17 fixed an issue where Smart Cover would overlap with the megamap. The Division update 1.17 fixed a bug where the Sewer Slayer commendation would not always update upon killing a named enemy. The Division update 1.17Fixed a bug that would allow the player to bypass the Agent with a Shotgun commendation requirements. When used, your Ballistic Shield has no skill mod active. It will no longer remove Critical Chance from your weapon. SMGs can be equipped. Ballistic Shield health is increased by 57% for every 3000 stamina. The Division update 1.17 added a PvP modifier to the D3-FNC set, causing it to require more damage done to proc in PvP. The Division update 1.17 fixed a bug where the Pakhan magazine stack is lost when the Meticulous talent procs. The Division update 1.17 increased base Rogue timer from 19 seconds to 90 seconds. The Division 1.17 fixed an issue causing a downed group member not having their manhunt status cleared while in a downed state. The Division 1.17 fixed not being able to vault over certain props from both directions. The Division update 1.17 fixed various locations where it was possible for the player to get stuck. The Division version 1.17 fixed a break in the floor which would prevent the agent from progressing. The Division 1.17 fixed a bug where the glimmer effect on rare vanity items would not disappear in the vanity items menu. The Division update 1.17 fixed an issue where a second Premium Vendor could appear after an agent purchased an Encrypted Cache. The Division version 1.17 fixed an issue with Encrypted Caches where the preview button still worked even though it was not present on the UI. The Division update 1.17 fixed an issue with the “The Armory” landmark in the Dark Zone where sometimes an agent would not receive a reward for clearing the landmark, and it would continue to display as active. The Division version 1.17 fixed an issue where the Green Cadet Cap and the White Cadet Cap looked identical. The Division 1.17 fixed an animation issue tied to using emotes after jumping from an object. Previously, update 1.16 was released. 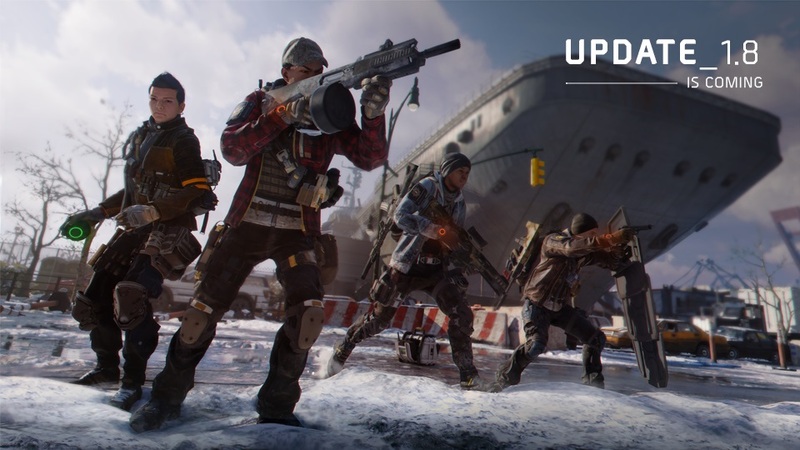 Check your game update and download latest the Division update 1.17 on your PS4, Xbox One, and PC.